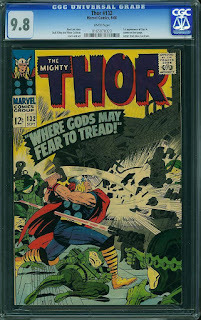 In my first post, when I started this blog all the way back in March, I told you how and why I bought a copy of Thor #132. If you haven't read that one yet and would like to, then click on this link right here. Now I'd like to get a little more in depth with this issue and also use it as an example of what can happen if you are able to snag a comic early, before any hype starts driving up the values, especially in the market that we're in today. But first let's work our way through the key issue notes. The biggest reason that this comic is getting any attention at all know is because it holds the first appearance of Ego The Living Planet. While at SDCC, James Gunn let us all know that Ego would be appearing in the new Guardians of the Galaxy movie as Peter Quill's father. The character will be played by Kurt Russell, and not by Al Pacino like the rumors stated a few months ago. Ego didn't start out as a sentient world. He was created much like many other planets are created. He was later given consciousness by the Stranger. Because of his age, and because he is one of the oldest living beings, he was inducted into the group known as the Elders of the Universe. Ego comes from a living bio-verse known as The Black Galaxy, which also makes it's first appearance in the pages of this issue. 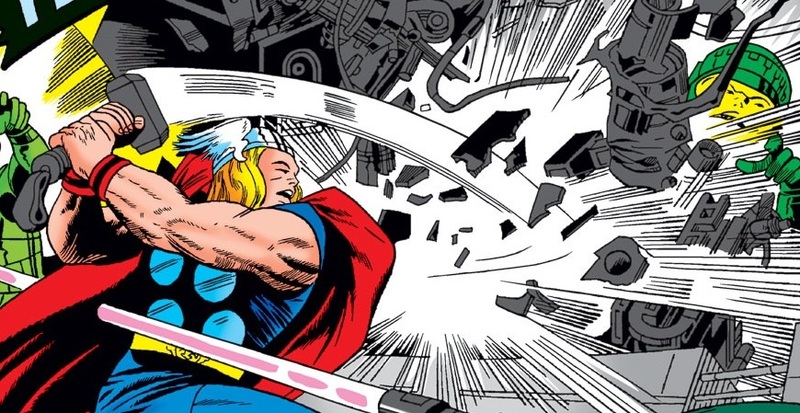 The rest of the first appearances in this comic are less known and don't really have very many appearances in the Marvel Universe. However, they are key note worthy, so on with the list we go. The Grand Commissioner is the leader of a space colonizing race known as the Rigellians. The Rigellians are a scientifically and technologically advanced alien race devoted towards amassing an empire via colonization. On Thor's journey to the Black Galaxy, the Grand Commissioner sent a humanoid robot named Recorder 211 with him to make and record his observations of the Black Galaxy. Up next on the list is an evolved pig named Sir Porga. Yup, you heard me right, an evolved pig. Sir Porga was created by the High Evolutionary as one of his first Knights of Wundagore. In this issue, we briefly see him on a plane taking a keen interest in the lovely Jane Foster. In the short back-up story, a drum is played to summon the Stallion of Doom. The stallion appears when a warrior who is worthy of entering Asgard is about to die. As far as I know, there are only two appearances of the Stallion of Doom in comics. I believe that covers all of the key issue notes, so let's take a look and see how many CGC graded copies are out there. There are only 573 copies currently on the CGC census, but I'd expect to see that number start to climb soon. It's surprising to see that most of the graded copies are high grade between 9.4 NM and 9.8 NM/M, with 9.6 NM+ having the highest amount with 177. There are a lot of raw copies out there and they're being scooped up pretty quickly, so expect these numbers to change pretty quickly. Since the confirmation at SDCC, sales for this comic have jumped up to some pretty high numbers almost overnight. Back in January, you could have snagged a 9.6 NM+ copy for around $250, and now they are selling close to the $700 range. Sales for 9.8 NM/M copies are seeing the same jump. There were a handful of copies that sold on July 24th ranging between $525 to $703. The latest sale on eBay for a CGC 9.8 dropped for $1,327 on July 31st. That's about double the average of the previous sales from only a week before.